After experiencing severe abdominal pain, Tania Hart was diagnosed with a malignant colon tumour. She was able to avoid any radiotherapy or chemotherapy, thanks to Professor Mortensen who removed the entire tumour through keyhole surgery. Read Tania’s story. In July 2012 I was taken by my husband to the John Radcliffe (JR) Hospital A&E with severe abdominal pains, where I was admitted to the Emergency Surgical Ward. The next morning, one of the doctors asked me some questions and I felt like he was taking me under his wing. I had no idea of his name or the huge impact he was going to have on my life. He ordered several diagnostic tests for me. These later confirmed that I had a malignant colon tumour. Over the next few days, the same doctor came several times to check in with me and my husband, introducing himself as Professor Mortensen. My husband works in the ambulance service, and I work at the JR, so this was a name we both recognised as the top doctor in the colorectal field. One week into my admission I was told that Professor Mortenson had an available slot and was going to operate on me the following day. I underwent eight hours of surgery! Luckily, Professor Mortensen was able to remove the whole tumour, meaning I did not need any radiotherapy or chemotherapy. To coin a phrase, he cut it out and threw it away. I was assigned a specialist nurse, Jay Bradbury, and over the next five years I had a yearly check up with her and Professor Mortensen to confirm all was well. Jay told me about OCCTOPUS, which I went away and Googled. I was so impressed by the fine work that the OCCTOPUS charity does for the treatment and care of patients. It is astounding what OCCTOPUS does, the equipment it provides cuts away so much more than a surgeon can alone and by such minimal procedure. More patients are living longer cancer free and recovery time is reduced so much, due to this colon cancer charity. I decided I wanted to raise money for OCCTOPUS. Previously, I had taken part in a few small running events, like the two-mile Santa run, but I decided to up my game. Professor Mortensen saved my life, and I was going to use it to give something back. I started to train harder, and managed a five mile run raising funds for OCCTOPUS. 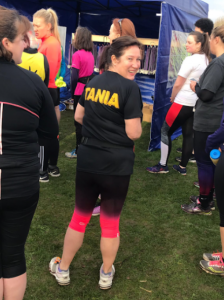 Tania successfully completed the half marathon in 2 hours, 37 minutes. 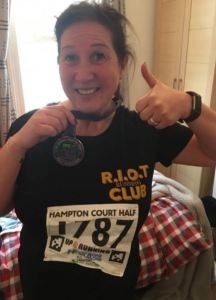 I recently completed the Hampton Court half marathon in 2 hours, and 37 minutes. I reckon I could have got under two hours and a half, but I had a problem with my normal running shoes, and so had to wear an older pair. Nevertheless, I was pleased with my result. I will be running the Blenheim 7K soon, and I hope to eventually run a full marathon for OCCTOPUS. It is my small way to say thank you to Professor Mortensen. Thank you, Tania. What an achievement. You can help Tania Hart raise money for this great cause by donating directly to their fundraising page. JustGiving sends your donation straight to OCCTOPUS Oxford Colon Cancer Trust and automatically reclaims Gift Aid if you are a UK taxpayer, so your donation is worth even more.